I just had to include this on my blog. 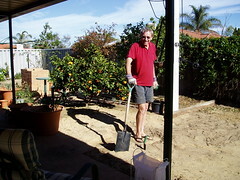 I took a photo of DH digging when he stood up and asked "Are you taking a photo of me?" and while he was talking, I took one. The Lemon, Mandarin and Grapefruit trees have been moved to the other end of the yard and so far, none show signs of rejecting their new home. Thankfully we haven't had any rain yet or the house would be full of that sand, sand and more sand.